UKRHOSTING Review 2019: Is UKRHOSTING a Good Hosting? Ukrainian web hosting company UKRHOSTING was established in 2002. Its web hosting solutions include shared web hosting, cloud VPS and VDS, dedicated servers, colocation services, and reseller solutions. UKRHOSTING is a Ukrainian web hosting company that was established in 2002. From data centers in Ukraine, Russia, Germany, the U.K. and U.S.A., this vendor primarily provides Unix and Windows hosting platforms for businesses in Ukraine. The UKRHOSTING website appears to be switchable between Russian, Ukrainian and English languages, but the English language version was unavailable at the time of writing this review. UKRHOSTING’s solutions are powered by data centers in Ukraine, Germany, the United States, and the United Kingdom. Users who prefer Windows to Unix as the operating system will have to contend with the fact that UKRHOSTING’s Windows platform will deny them access to referrer logs, agent logs, error logs, and Modlogan log analyzer. Instead of one of the popular control panels such as cPanel or Plesk, UKRHOSTING provides its customers with the H-Sphere control panel. This control panel has a convenient user interface for managing your allocated resources, it allows you to automate time-consuming tasks, and you can customize it to meet your needs. UKRHOSTING offers a backup solution that automatically backs up the entire database every few days, and you can access the backup copy of your website from the H-Sphere control panel. UKRHOSTING’s packages are priced in Ukraine hryvnia, U.S. dollars, Russia rubles, and euros. The prices are more or less in line with other Ukrainian vendors of similar hosting solutions. Customers who subscribe to biannual or annual billing cycles get 25% and 50% permanent discounts respectively. This vendor has streamlined resource scaling (for a fee) so that customers can add resources and functionalities in line with their growing websites. You can also downgrade your plan by switching to a cheaper tariff, with the unused balance in your account automatically transferring to the new tariff. UKRHOSTING offers free domain registration for .in.ua and .pp.ua domains to customers who sign up for annual billing. SSL certificates are provided at reasonable prices from the likes of GeoTrust, Comodo, and RapidSSL. The technical support this vendor offers during SSL installation is only available to its hosting solutions customers; therefore non-hosted customers who buy these certificates should have the necessary skills to install them (including sufficient understanding of the English language). Although this hosting firm offers a money-back guarantee as part of its refund policy, it does deduct installation costs and the costs of services already used. Except for emergencies (in which case you can phone them), UKRHOSTING insists that customers contact them via email. There is no live chat and no support ticket system. Since support is not 24/7, you may have to support yourself via the community forum or the knowledge base that includes helpful tutorials. 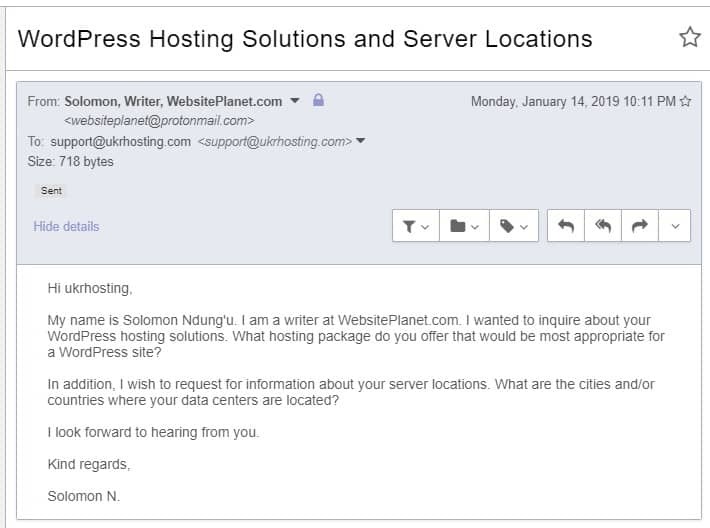 As you can see below, I emailed the support team to enquire about their WordPress hosting solutions, but I received no response. UKRHOSTING offers an array of hosting solutions that are suitable for most users from personal bloggers to large Ukrainian corporations. However, the vendor’s unresponsive pre-sales support team could keep many would-be customers away. Wondering how UKRHOSTING stacks up against other Web Hosting companies? Enter any other Web Hosting company and we will give you a side-by-side comparison.